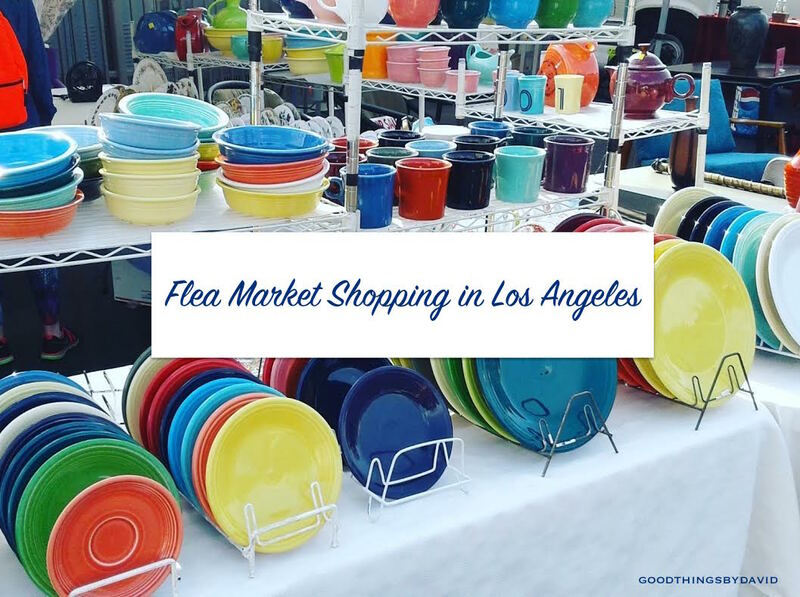 I've written at length about the flea market shopping that can be found throughout Southern California. 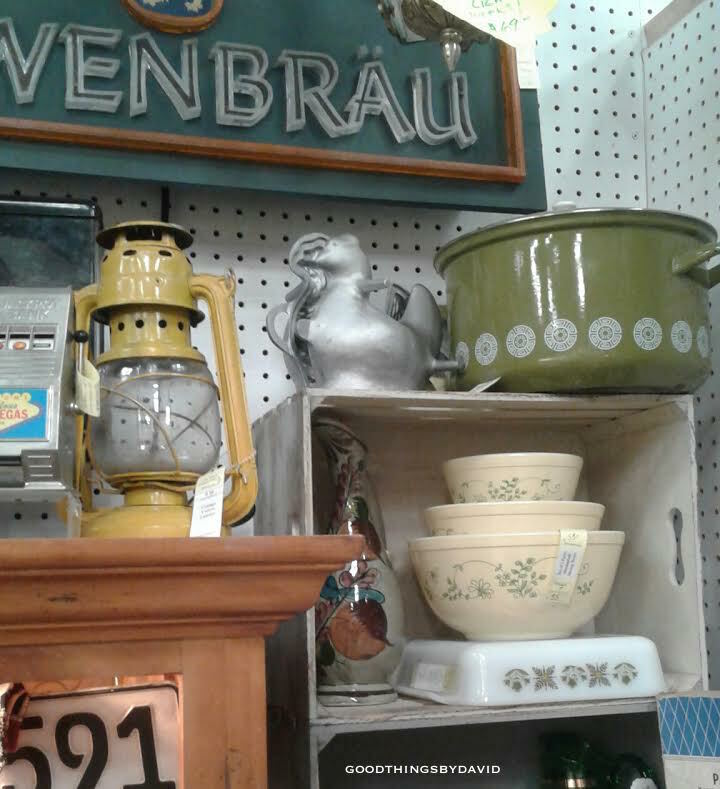 It's always fun to show you the items I encounter at these markets, because it gives you an idea of the variety that people sell and collect. 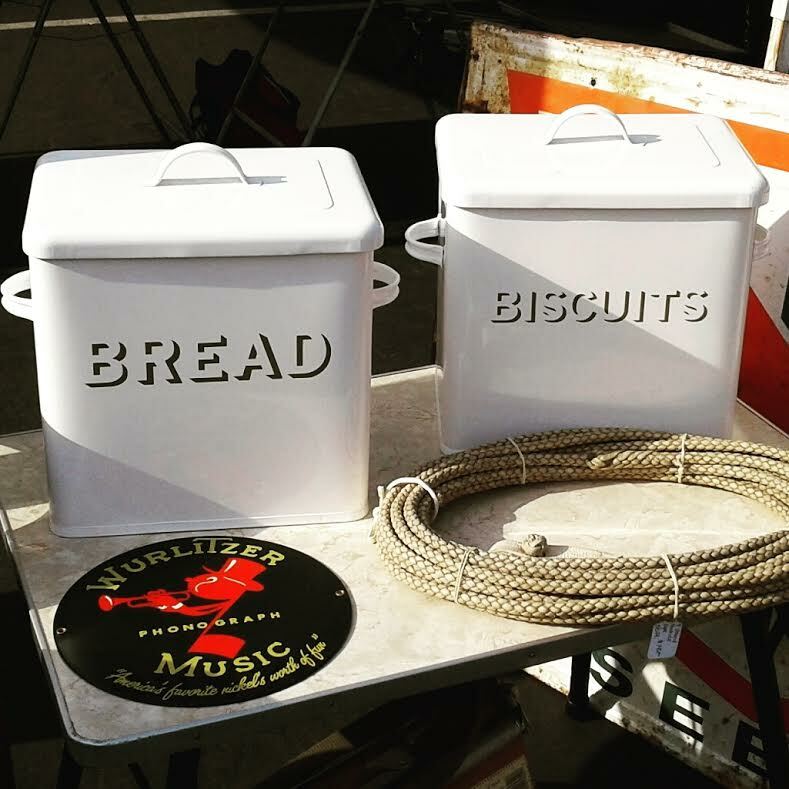 Certain vendors come back year after year, but new ones crop up here and there. For me, it's all about the thrill of the hunt for the things that I like. 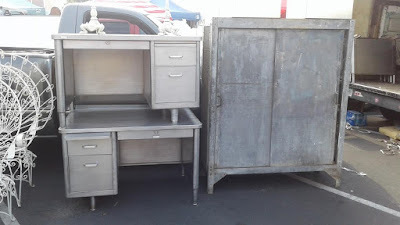 Friends are always telling me that it would be fun to go on these trips with me to the flea markets, and I think to myself: "as long as we don't fight for the same items, sure!" Can you imagine having to fight and elbow your way for something with one of your friends? I certainly wouldn't want to be in that situation. 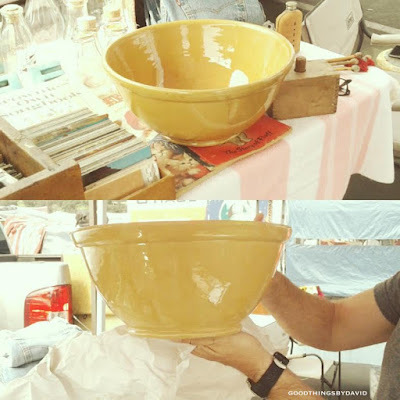 The two major flea markets that I like to visit when I'm in Southern California are the Rose Bowl Flea Market and the Long Beach Flea Market. One is held the second Sunday of every month, and the other is held on the third Sunday of every month. 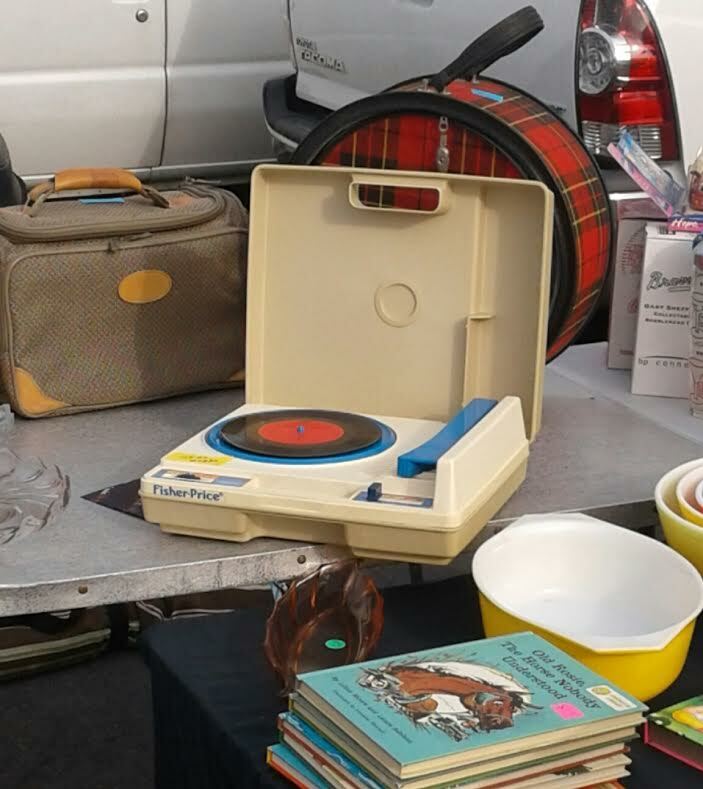 I used to own one of these Fisher-Price record players! I remember playing my ABBA 45s and 33s on it. My baby brother is, really and truly, the ideal person to shop with, because not only do we collect different items, but we always find several things that take us back to our childhood. It's so much fun to encounter toys and little knickknacks that we used to have when we were kids, such as my yellow, heavy-duty Tonka trucks and various lego sets, or my brother's model trains (HO scale) and hot wheels. How many of you remember when ice cream and sherbet used to come in boxes? It didn't take me long to zero in on some Martha by Mail items. 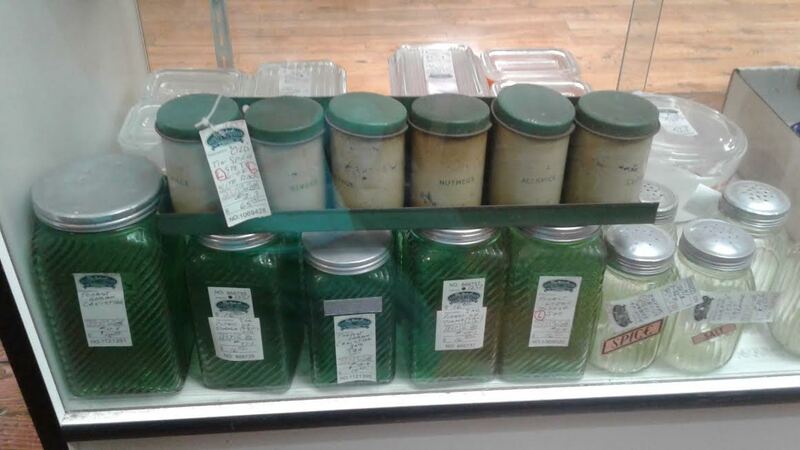 Although these enamelware canisters are not truly vintage pieces, they are very collectible. The Martha by Mail catalog offered these white-handled Bread & Biscuits canisters for a very short period of time. 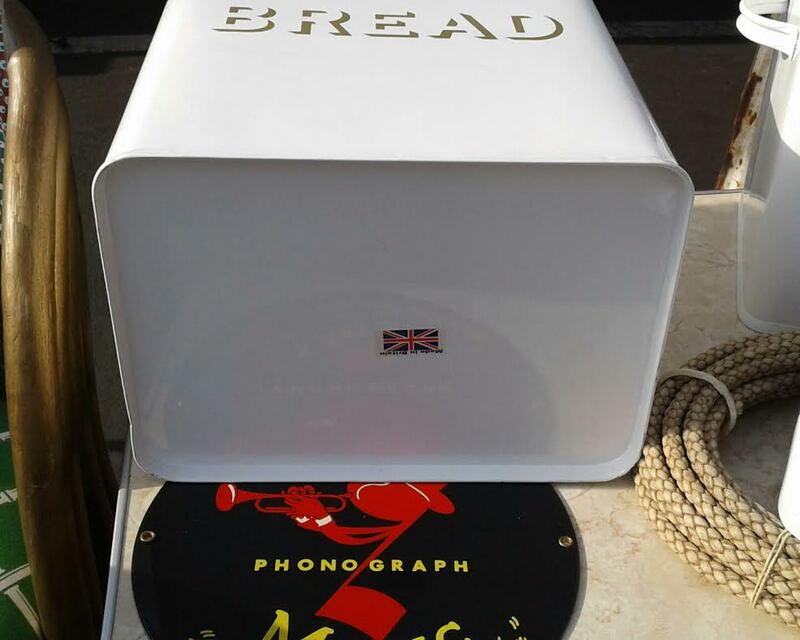 As you can see, they were made in the U.K. 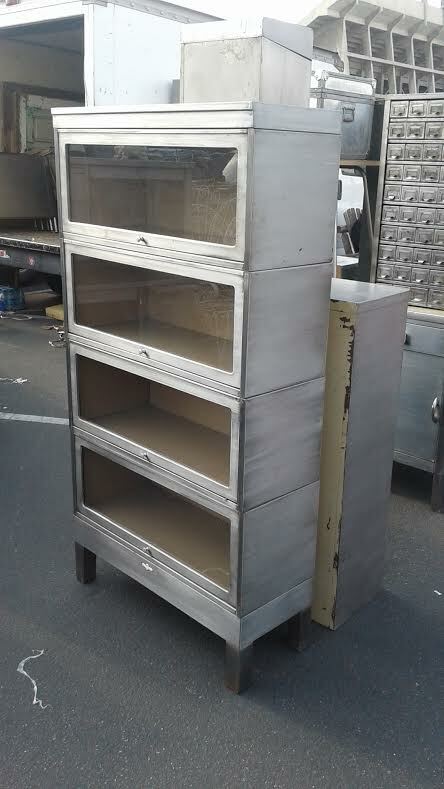 The steel canisters are large and heavy, making them ideal for use in the kitchen or in a mudroom for storage. 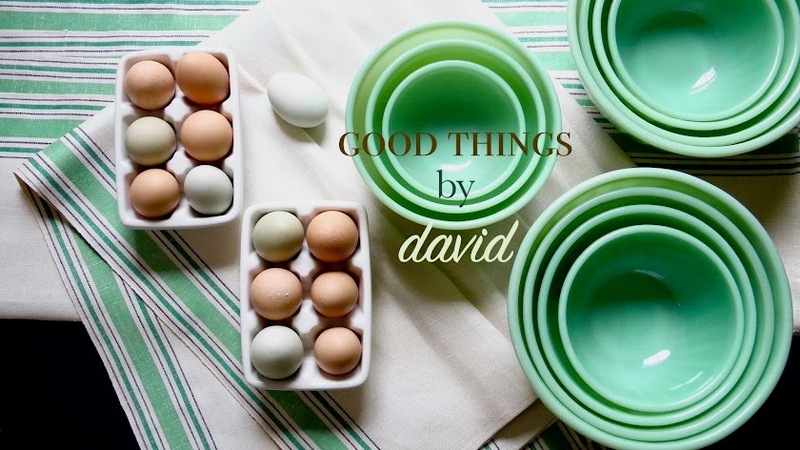 Who remembers the cast-aluminum chicken cake mold from Martha by Mail? These can easily be found on eBay throughout the year. 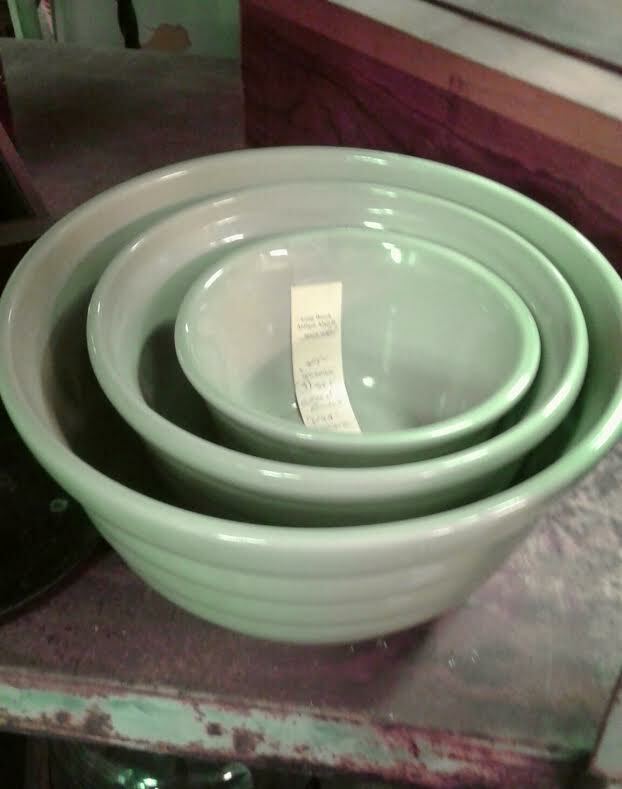 My apologies for the grainy photo, but I had to include it because this set of green mixing bowls was offered through Martha by Mail. 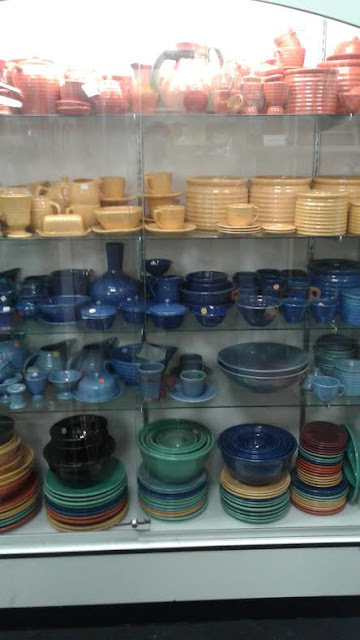 They were made by Monmouth Pottery of Illinois. I felt like I was encountering miles and miles of colorful Bauer Pottery at the flea markets. Your eyes don't deceive you. 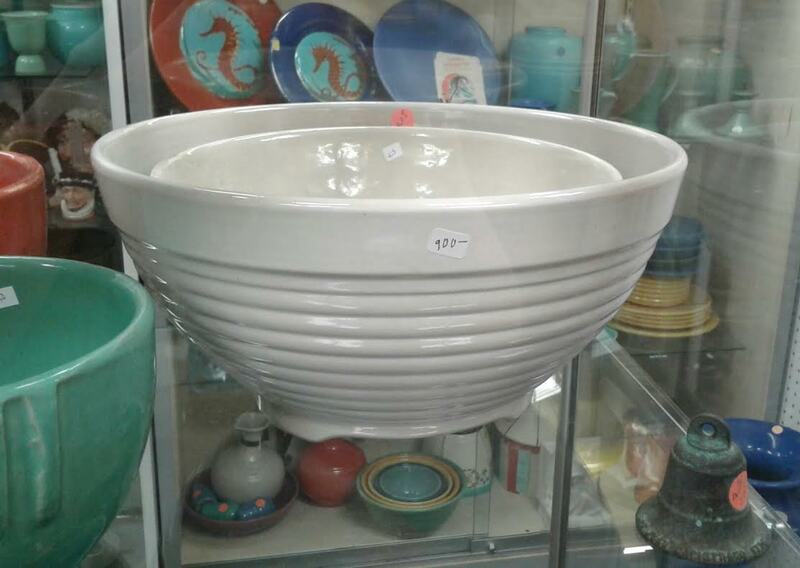 This gigantic 15-inch punch bowl by Bauer was priced at $900. They're obviously priced for the serious collector. 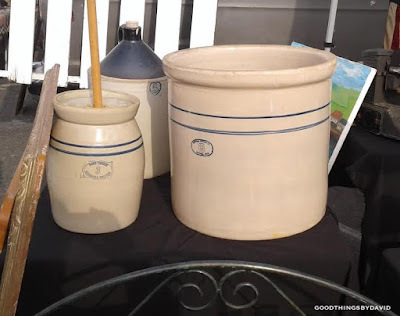 Butter churns, pickling crocks and jugs for alcohol made from heavy stoneware are always nice to encounter. The large 15 gallon (the number on these types of crocks tell you the capacity of the vessel, in gallons) pickling crock can be used for so many things throughout the house. 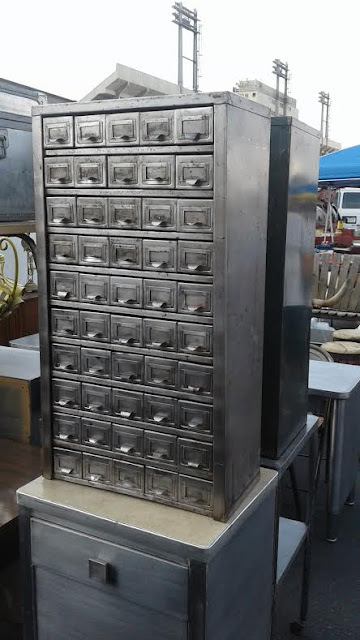 I think something like this would be amazing in an entryway or next to the fireplace as a receptacle for wood, but the crocks would also be suitable for use as recycling bins in the kitchen. These yellow Bauer bowls had my name written all over them. After a quick inspection, I struck a deal with the vendor. The 13-inch and 14-inch yellowware bowls were safely packaged in one of my totes. I never knew that Hamilton Beach mixers offered yellow glass accessories. This one appeared to have the bowls and the juicer attachment in prime condition. The set of six spice tins made me smile, because all I kept thinking was how worry-free to have only bothered with 6 spices back in the 1930s and 40s. 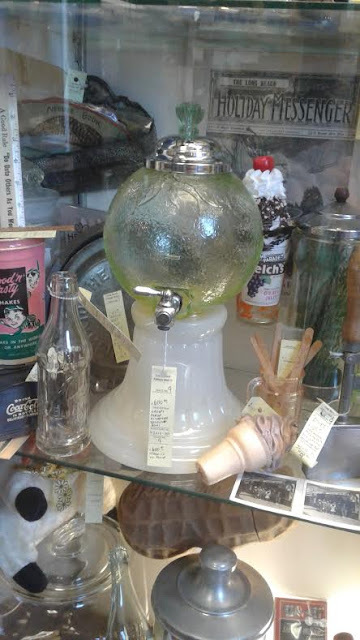 This glass vessel, at quick glance, looked like a gumball machine. Upon closer inspection I found it to be a soda fountain syrup dispenser. The vaseline glass sphere and its milk glass base were in such good condition. 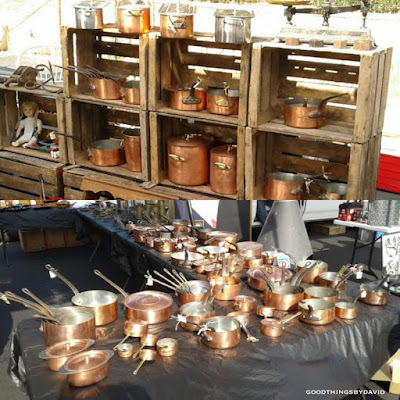 I don't know if this vendor was a former chef, but they were definitely French. I caught snippets of his conversation with a potential customer, and there was a very thick French accent. 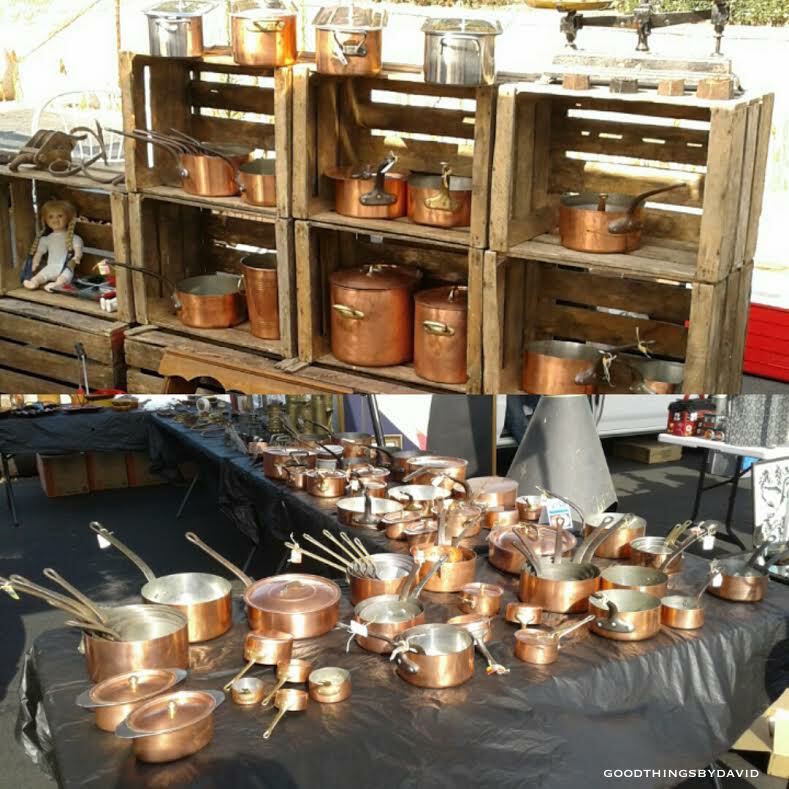 For a few minutes I toyed with the idea of picking up a few of these French copper pots and pans for my kitchen. 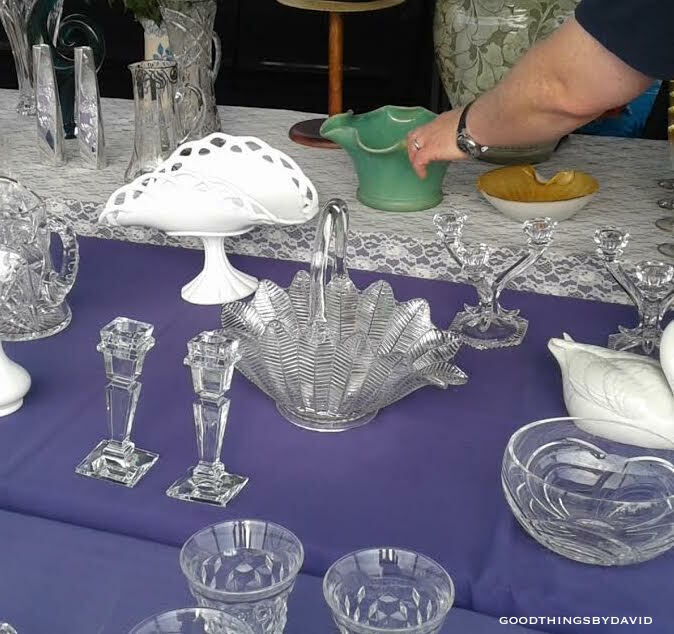 The thought of starting a new collection was a bit daunting, though, so I walked away from it. The feather basket by L.E. Smith Glass is so beautiful. 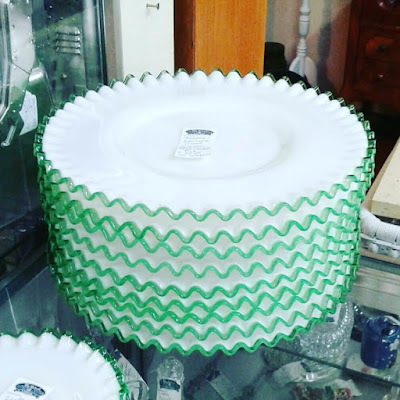 I'm told that this pattern by Fenton Glass, "Emerald Crest", is highly desirable. 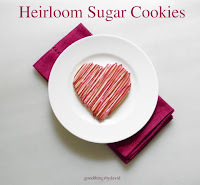 They would be perfect for serving desserts or light lunches. 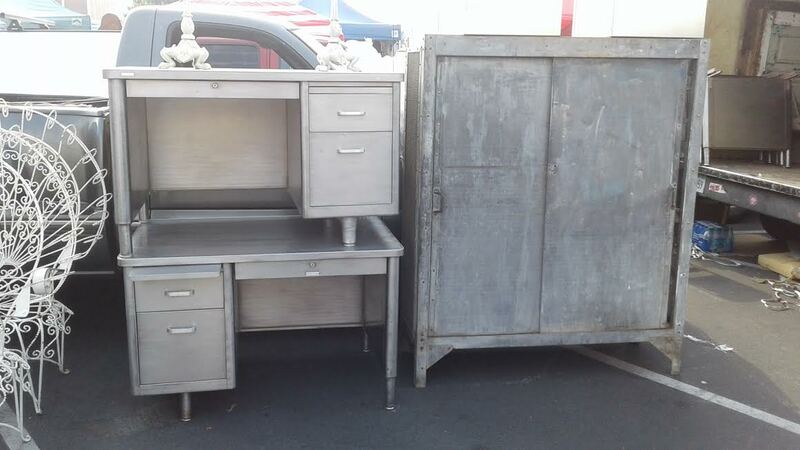 The stripped metal office furniture that is available from certain vendors is so amazing. 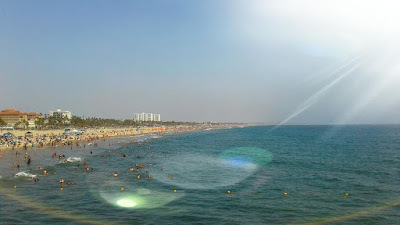 I like to imagine what I would do with such pieces if I lived in the Los Angeles area. 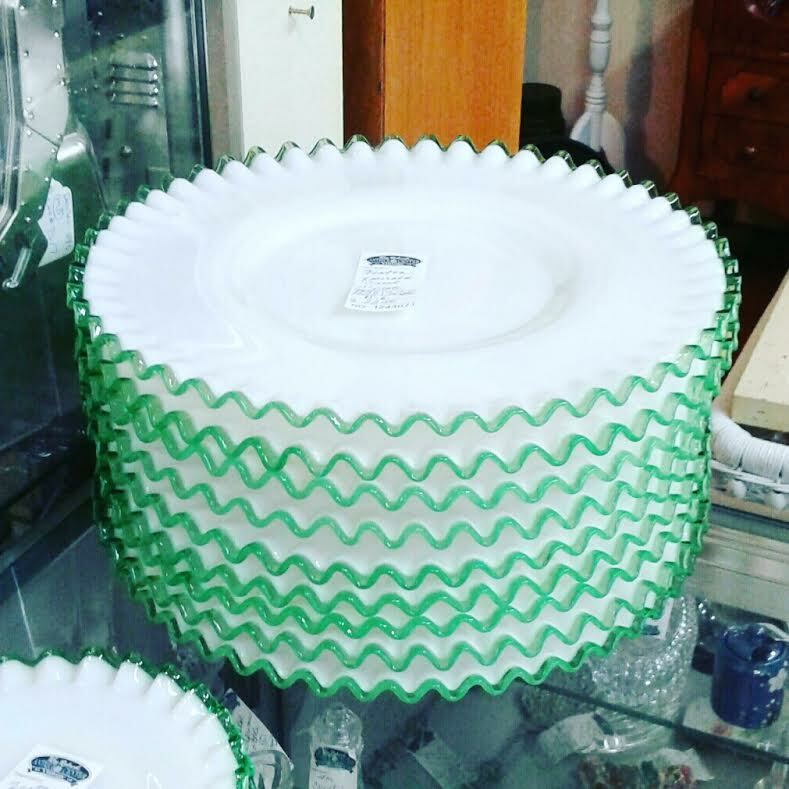 Can't you just picture this metal glass-fronted cabinet holding some superb collection of jadeite or maybe some milk glass? I noticed a vendor who had this sad-looking Hobart 5qt. 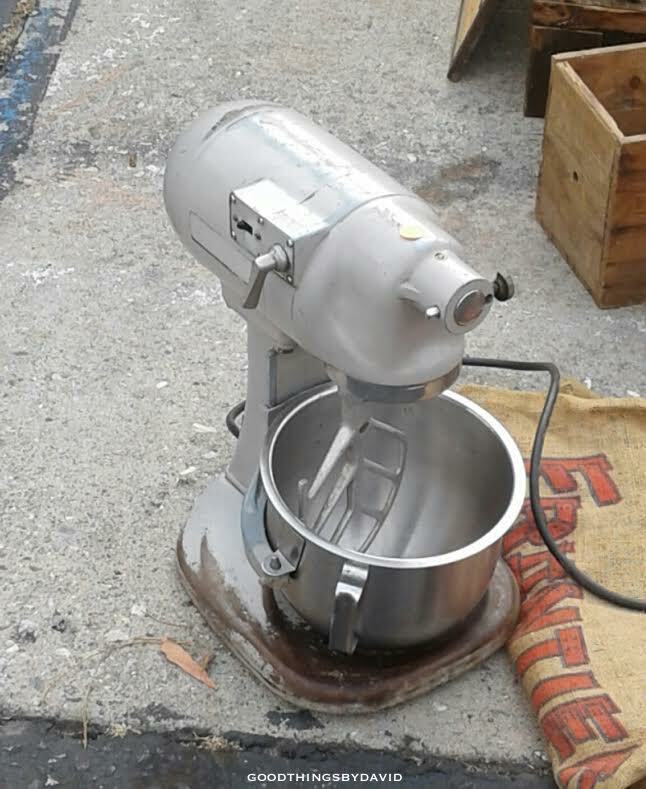 mixer sitting there on the asphalt, so I walked up and inspected it. The vintage mixer looked like it had seen better days. The metal was completely scuffed and worn down in many areas, and I noticed that it only came with the mixer bowl and the paddle attachment. I asked the vendor if it worked, and he said yes, but there was no way to prove it. My brother and I walked away from it. About an hour later, I wanted to go back to see the mixer again. It was nagging at me that the poor thing was probably still sitting there. 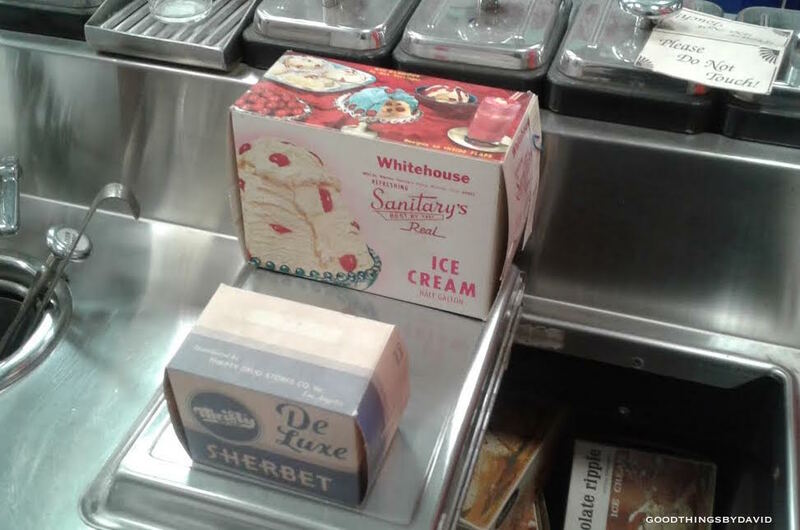 I remember telling my brother that if it was still there, I'd check the price out and see if I could counteroffer. 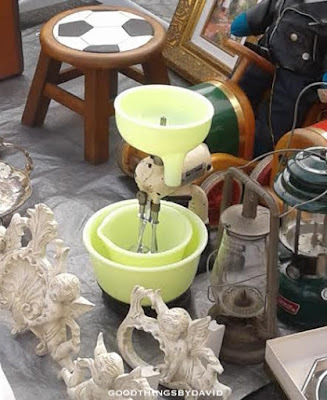 When we finally found the vendor, sure enough, the mixer was still there. I asked him what his price was and he told me, no joke: $45.... I was a bit dumbstruck to say the least. My first thoughts were: counteroffer, and then worry about whether it works or not when you take it back. We finally settled on $35. Yes, $35!!! 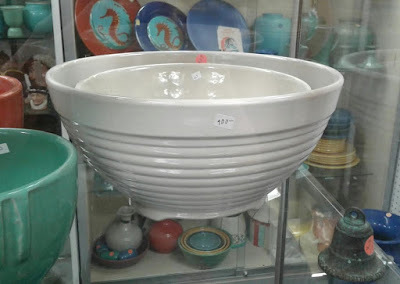 I knew that the bowl itself was worth more than that! Long story short: I was able to determine that the mixer worked beautifully, however, I was not thrilled with the condition of the finish. 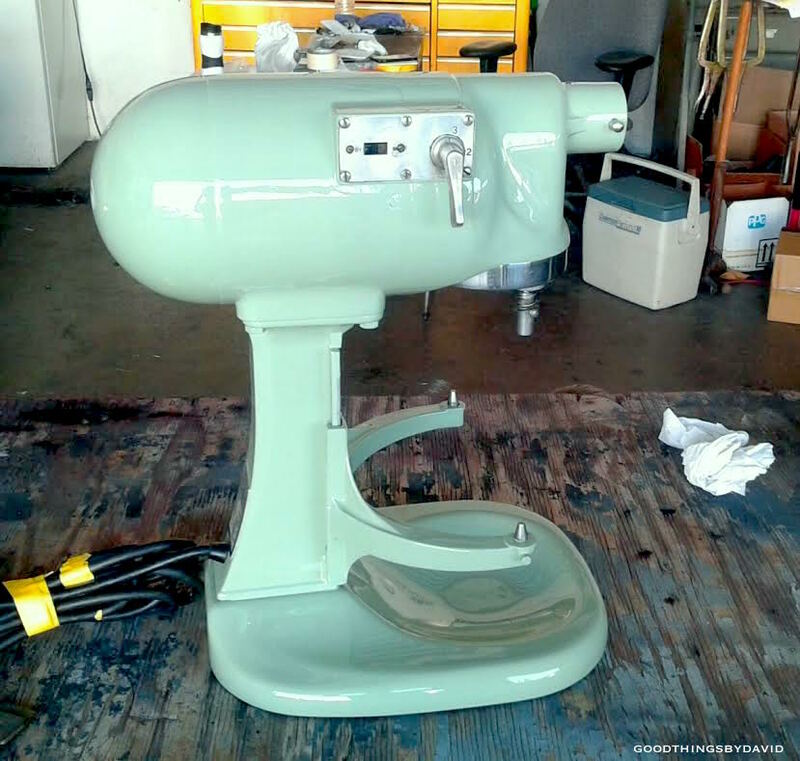 My brother told me to ask local body shops whether or not they could refinish the mixer for me. After being turned down by a couple of them, I began to lose hope. Finally, though, one mom and pop body shop told me to bring it in because they thought they could tackle the mixer. After they quoted me a price, I was then left with the task of finding a color. Should I go with a standard white or try something bolder? Being that I was at an auto body shop, I asked if they had any color palettes. The gentleman gave me a book of automobile colors, which included the pain line for Fiat cars. 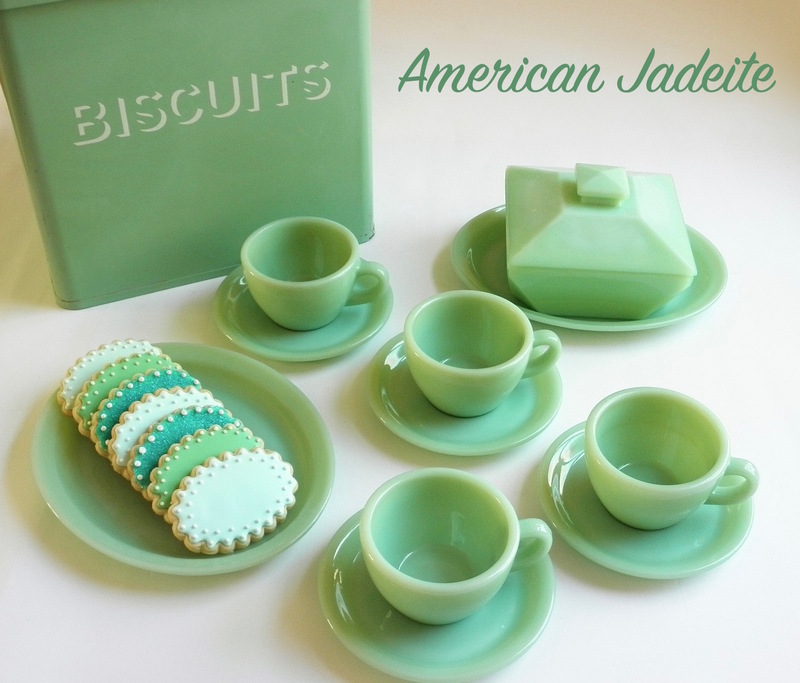 Remembering how much I loved that minty-green Fiat 500 color (chiaro verde), I immediately chose that on the spot. The results are nothing short of spectacular. You should have seen now giddy I was when I saw my beautiful, vintage Hobart mixer sitting there in the shop. It was everything I had thought it would be. 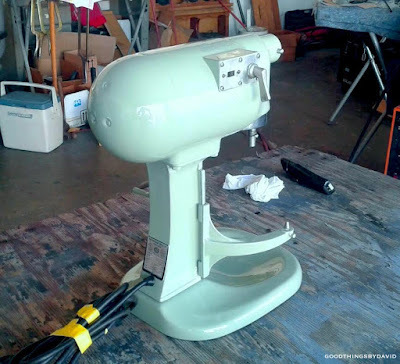 I am so happy that I took the risk, not only of buying the mixer, but of choosing a color that would complement my kitchen. Next time around I plan on taking a little cart or wagon with me just in case I need it. My tote bags were rather insufficient for some of my haul. To those who said to me, "why are you posting so many photos of hamburgers? ", I have to say that I normally don't eat like this. When I'm on vacation the diet is thrown out the window. 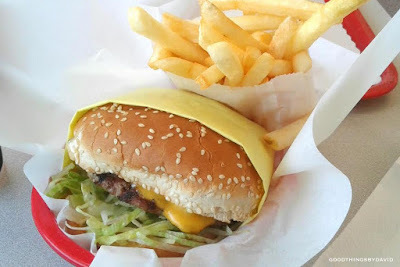 If I want cheeseburgers and fries, I'll have them! I can't visit Los Angeles without a helping of some rainbow roll sushi. 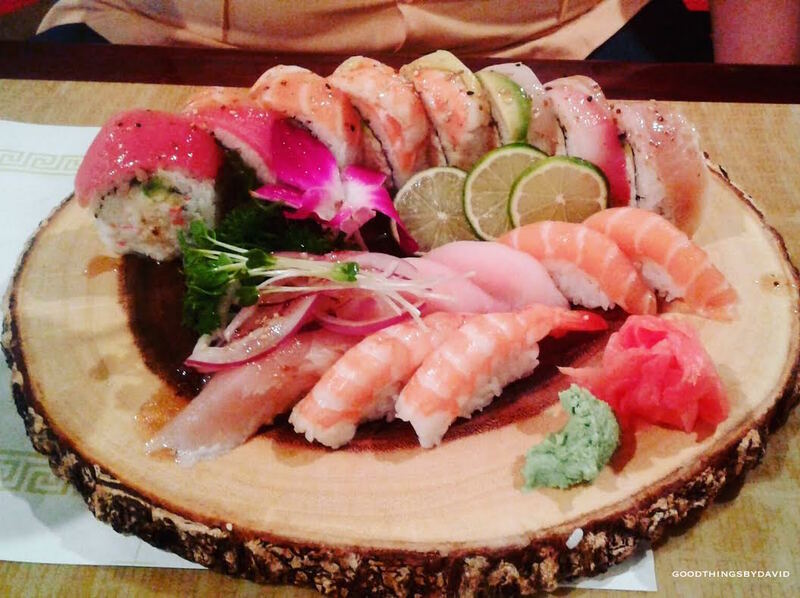 Sushi restaurants abound in Southern California, and it's always so fresh and so delicious. Sure it's fun going to flea markets for my collectibles when I'm in Los Angeles, but I think that more importantly, I enjoy spending time with family and friends. I can't wait to go back in a few months! If you're in the Los Angeles area anytime soon, check out the local listings for the flea markets that I mentioned. You will absolutely love them. I hope you put the Hobart in your carry-on. That surely would have given the TSA agent a chuckle. Great find....kudos for your restoration ! !